The Big Island is becoming an increasingly popular destination for many Hawaii visitors, and it’s not hard to tell why. Hawaii (it’s real name) has a diverse landscape, the state’s only active volcano, and a culture that is unique and welcoming. The Big Island also has a multitude of adaptive activities, accessible hotels, and friendly restaurants that accommodate travelers with disabilities. Kayaking: Kona Boys Kayaks invites you to paddle single or double kayaks or stand-up boards through dolphin and turtle habitats in Kamakahonu Bay. Ample parking, life jackets, and snorkel equipment available at kiosk on white sand beach at King Kamehameha Hotel. Big Island Air Tours: Admire volcanoes, mountain peaks and waterfalls in Big Island Air’s 9-seater air-conditioned jet-prop turbine Cessna 208.Depart Kona International Airport. Disabled parking with easy approach to plane on 40 yards of flat surface. Assistance needed to manage 4 pull-down stairs for boarding. 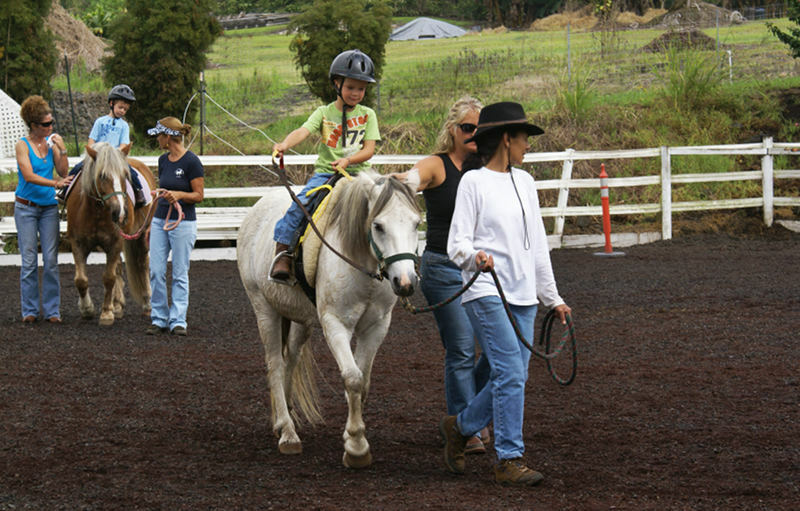 Therapeutic Horsemanship: Connect with Therapeutic Horsemanship of Hawaii and let a gentle horse do the walking for you! Arena lessons are available with Physical Therapist/owner Nancy Bloomfield. Horseplay Equestrian Center has a wheelchair mounting ramp and sidewalkers for your safety. This activity is only for those with disabilities. Fire Hatt Sport Fishing: Experience a memorable day aboard FIRE HATT, a pristine 43 foot Hatteras with Capt. Chuck Wilson, retired Chief in the Fire Dept. and former Paramedic. This family-friendly operation is clean, and air conditioned. Safe ramp, near-by parking, 4, 6 and 8 hour trips available, all fishing equipment provided. Therapeutic horsemanship is a great way to experience horseback riding, even if you have limited mobility. The west coast of the Big Island also has 11 accessible beaches for travelers with disabilities: Spencer Beach Park, Hapuna Beach Park, Kua Bay State Park, Kaloko National Park, Kahonaiki Beach Park, Honokohau National Park, Old Kona Airport Park, King Kamehameha Beach, Honl’s Beach, White Sands Beach, and Kahalu’u Beach Park. Mokuaikaua Church: This is the oldest church in Hawaii. Ramp at north entrance, off-street parking. Greenwell Store Museum: A visit to the H.N. Greenwell Store at Kalukalu will take you back in time, to Kona mauka in the 1890s, a multi-ethnic society centered on ranching and farming. Accessible and easy parking. Greenwell Gardens: See more than 200 species of plants that grew in the traditional farms and native forests of Kona before Captain Cook arrived in the late 18th century. Path surface is flat-gravel and grass. Click here to learn more. Herb Kane Art Gallery: Ample parking, level lobby area. Original watercolors of island’s renowned illustrator in the lobby of King Kamehameha Hotel. Ample parking, level lobby area. For more information, go here. Sunset Cruise on Fairwinds Catamaran: Hawaii boasts some of the finest snorkel and diving locations in the world, and you can enjoy a Fair Wind experience during your time on the Big Island. Must manage pier boat entry on Keauhou Bay. Evening Manta Ray Sightings: This is a free talk that takes place at Paakai Point Monday thru Saturday evenings just after sunset. Portuguese Sweet Bread: The Kona Historical Society practices the traditional art of baking Portuguese bread in a large wood-fired forno, located in the pasture below the H.N. Greenwell Store Museum. Click here to learn more. Greenwell Gardens boasts more than 200 species of plants. The Big Island is a top visitor destination for a reason: less hustle-and-bustle than Honolulu, yet all the amenities. So, enjoy your Big Island adventure, no matter what your abilities.